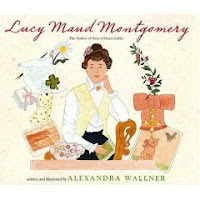 Lucy Maud Montgomery: The Author of Anne of Green Gables by Alexandra Wallner. Library copy. Picture Book. The Plot: A picture book biography for young readers about L.M. 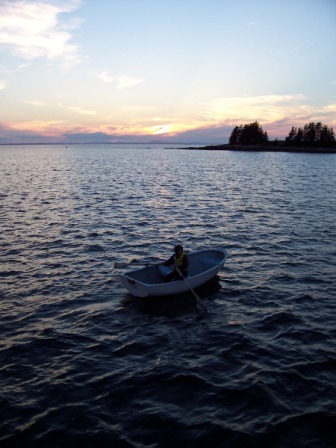 Montgomery, the author of Anne of Green Gables. The Good: I enjoyed this book, but then, I am a fan of Anne. And the audience for this book? Fans of L.M. Montgomery, her Anne books and Emily books and other works. I think I was in fifth grade when I read the first Anne book; and while I read the second and third shortly after, my interest died down. It wasn't until I was older, in high school, that I went back, reread the whole series, and loved it. Because, and here is a part some people tend to forget -- the Anne books aren't for young kids. Yes, Orphan Anne will enchant younger readers; but Teacher Anne? College Anne? Young Mother Anne? Speaking personally, at eleven it was YYYYYAAAAWWWWNNNN. Add a few years, and I was all over them. Which brings me to my only real question for this book: audience. After reading the Anne books in high school, and believing the myth that the Anne books were about LMM's life, I went on to read LMM's journals. What an eye opener; an education about the realities of turn of the century life, as opposed to romanticized myth; lessons in how "real life" are turned into "art," ending for me the myth that Anne = Lucy Maud; and a heartbreaking look at a life. This beautiful picture book, with illustrations that evoke a historical feel with their folk art appearance, does a great job of setting forth her life, the writing of Anne, and addresses some of the complexities of LMM's life (her father, her stepmother, relationship with her grandparents, publisher issues) while omitting some of the darkness (the reasons for her marriage, the loss of a child, problems with her adult sons.) I am adding it to my "wish list" of books about LMM that I want to own. Here's my question: audience. Don't get me wrong: great, great book. But why would someone young enough to read this picture book be interested in LMM? Aren't the readers of LMM old enough to want something more? I'd love input from you all in the comments! Must. Find. Book. at library. Like you, I'm an LMM fan. Like you, I agree - the typical LMM reader is long past PBs, but they'll probably use them for reference when researching biog reports. Have you read Lucy Maud and Me? It does seem to me that most picture book readers wouldn't be interested in this book. But I can see it as a gift book for older people who simply love LMM (of which there are clearly plenty). Personally, I'd love to have this book. However, I am hesitant about ordering it precisely for the reason you mentioned. I love the Lucy Maud Montgomery Album, but that's for adults. I've heard wonderful things about her diaries, but they aren't easy to find. Having read the journals, I don't think I would enjoy a book that paints an upbeat picture of her life. Always in the background I'd be thinking it was a lie. I wouldn't say upbeat; as I mention, it does say how her father took off, her treatment by her stepmother, and the relationship with her grandparents. What it omits is that she married to get married (and I can understand THAT being a concept to wait to introduce to younger readers), the death of one her babies, and the problems with her sons. It's been a few years since I've read her journals, so I'm sure I'm missing things, but I think it did a good job without overwhelming the target age group with misery. Yeah, it was more her horrifying husband who drove her into a deep depression that I was thinking of. The key thing I remember is that he was a minister who believed he was destined to go to hell. Which doesn't exactly make for a Seventh Heaven kind of environment. I understand why they didn't include this stuff. I think I'd just be depressed to read something about her that left it out, because I'd know it was lurking out there "unspoken." Longtime LMM fan here, thanks for reviewing the book. I'm glad to know there's a new book out about her, even if it doesn't exactly tell the whole story.